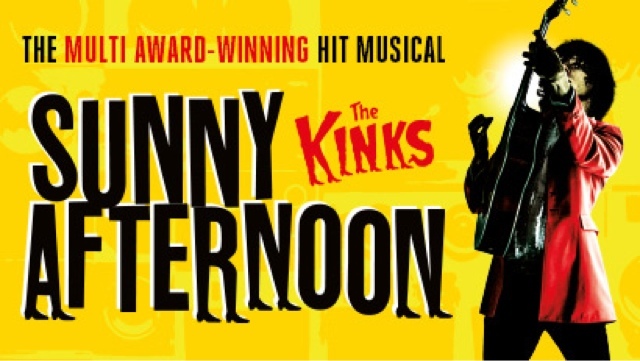 The King’s in Glasgow warming up for a spell of brighter weather this week as the hit musical based on the true story of The Kinks arrives for a five night run at the venue. Starring Ryan O’Donnell as ‘Ray Davies’, with Mark Newnham as ‘Dave Davies’, Garmon Rhys as bassist ‘Pete Quaife’ and Andrew Gallo as drummer ‘Mick Avory’. They are joined by: Jayne Ashley; Victoria Anderson; Nathanael Campbell; Marcelo Cervone; Tomm Coles; Deryn Edwards; Sophie Leigh Griffin; Sam Haywood; James Hudson; Richard Hurst; Cleo Jaeger; James Lorcan; Joseph Richardson; Robert Took; Alex Wadham; Libby Watts; Michael Warburton; Lucy Wilkerson and Lisa Wright. Featuring some of The Kinks’ best-loved songs, including You Really Got Me, Waterloo Sunset and Lola, SUNNY AFTERNOON tells the story of the early life of Ray Davies and the rise to stardom of The Kinks. The Kinks exploded onto the 60s music scene with a raw energetic new sound that rocked a nation. But how did that happen, where exactly did they come from and what happened next? Set against the back-drop of a Britain caught mid-swing between the conservative 50s and riotous 60s, this production explores the euphoric highs and agonising lows of one of Britain’s most iconic bands and the irresistible music that influenced generations.